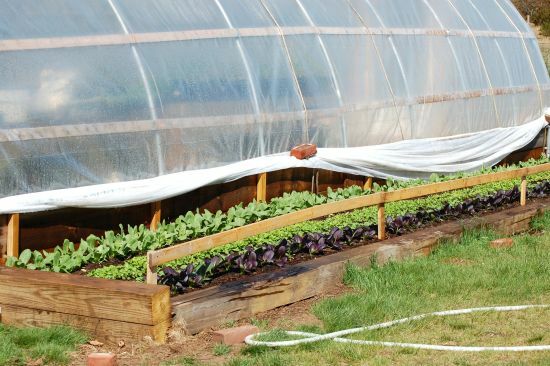 It’s only May 1 and already we may have grown the prettiest vegetable we’ll see all season. (You can remind me I’ve said this when I start waxing on about peas and cherry tomatoes and Fairy Tale eggplants.) 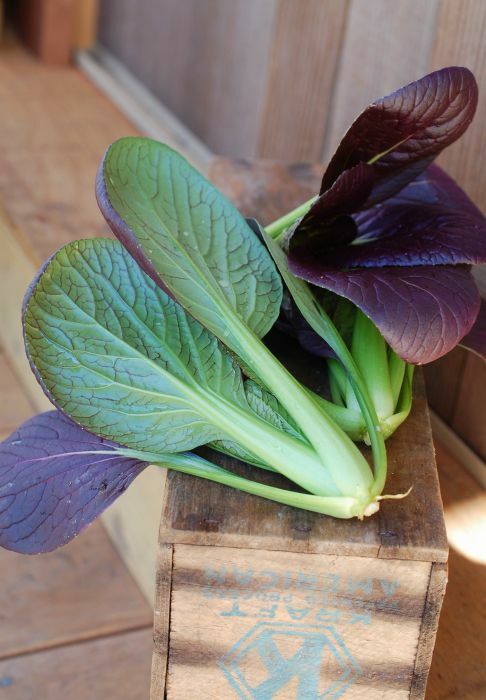 But honestly, this little purple pac choi (aka bok choy) is simply stunning. We can’t keep it at the farm stand for a minute, and I’m hoping I’ll get another round transplanted before it gets too hot. 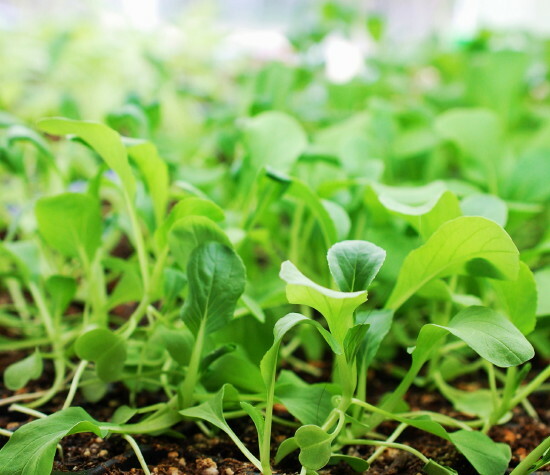 If you’re interested in growing this ethereal veggie (sweet, crunchy, tangy and light), you can still order seeds from Fedco and plant it in the fall. Me, I think I’d better start eating more of the stuff. The purple color is the result of anthocyanins, which supposedly improve memory. I could use that, since I completely forgot to make time for the blog post this week (a lot of farm work going on around here!) 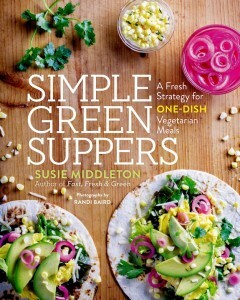 and now I am off to Maine to teach two classes at the fabulous Stonewall Kitchen this weekend. Wish you could all be there to join me! I was heading out to the farm stand with this bowl of radishes the other day when a friend intercepted me and bought one bunch straight out of the dish. After that, I rushed in to get the camera before the next bunch disappeared (which it did, very shortly thereafter.) 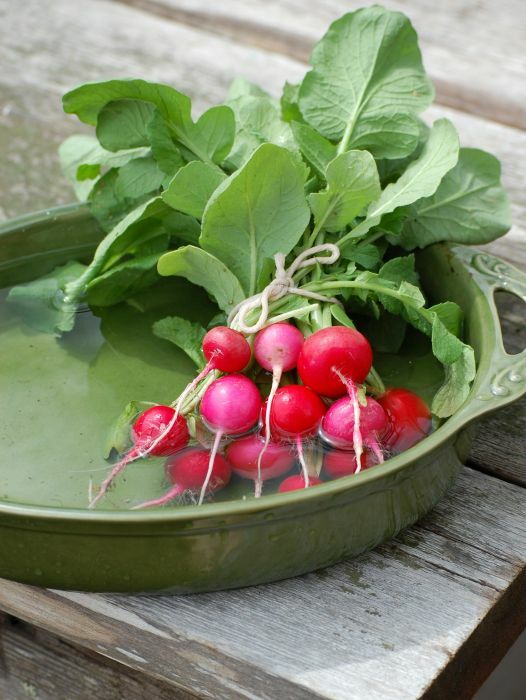 I don’t blame these folks for snatching up the radishes—honestly, is there a cheerier harbinger of spring? 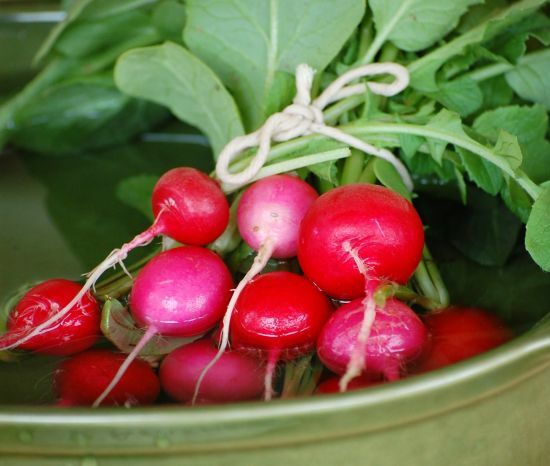 Well, I guess you could name quite a few things (flowering trees, singing birds, green grass), but in the vegetable world, radishes are as cheery as it gets. And thanks to the hoop house, I’ve got radishes in April—yippee! I am celebrating the small stuff all around the farm today as it happens to be warm and sunny, and I was beginning to think “warm and sunny” was some mirage I’d never quite reach. (I should say it is “warmish” here—high 50s.) On Monday it blew so hard that the latch on the gate to the big chicken pen popped open (which it hasn’t done in previous storms) and all of the 200 chickens in it went for a walkabout—over to the neighbor’s woods, through a pine grove, around the future pig pen, and just generally anywhere they could disappear. It took us the better part of the day to get them all back in. Argh. 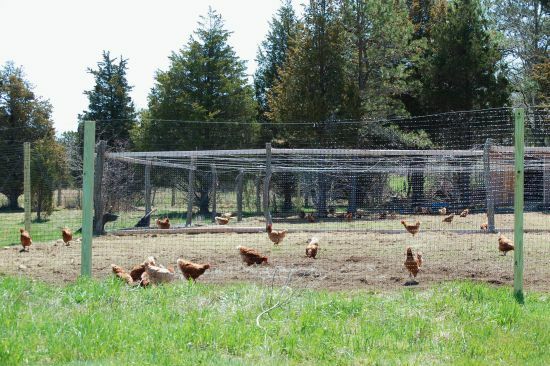 Not to be snide, but I have to say that one of the things I am celebrating today is no wind—and chickens happily back in their pen. Also, this morning I was reading one of my favorite blogs, Finding Your Soul, and in his post today, “Everything We Need Is Right Here,” David Anderson talks about all the wonder that’s right in front of our eyes while we’re off seeking something better somewhere else. 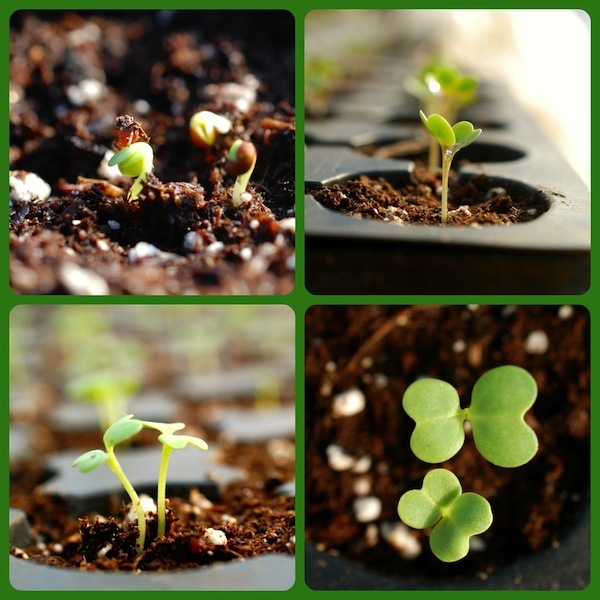 So I thought to take the camera and snap a few other things I’m marveling at now that spring is actually coming to Green Island Farm. 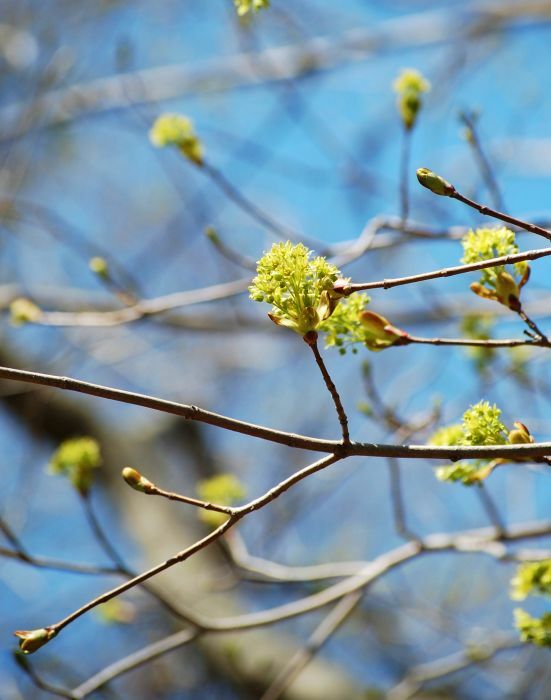 Chartreuse maple flowers unfurling on bare branches against a Carolina blue sky. Big fat healthy tomato plants in the greenhouse. 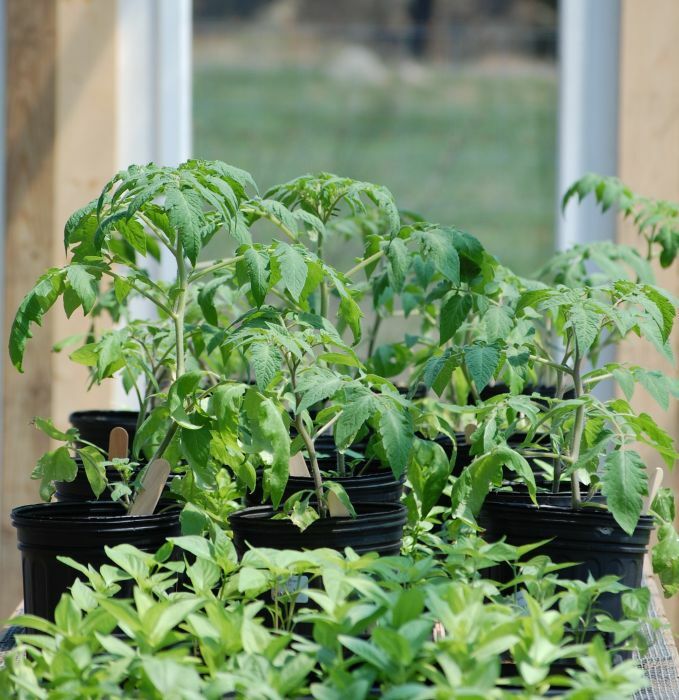 We started our “early” tomatoes in February and have managed to bring them along nicely, letting them hang out in the hoop house by day and stay snug inside the house at night. Copious amounts of bok choy to sell at the farm stand. 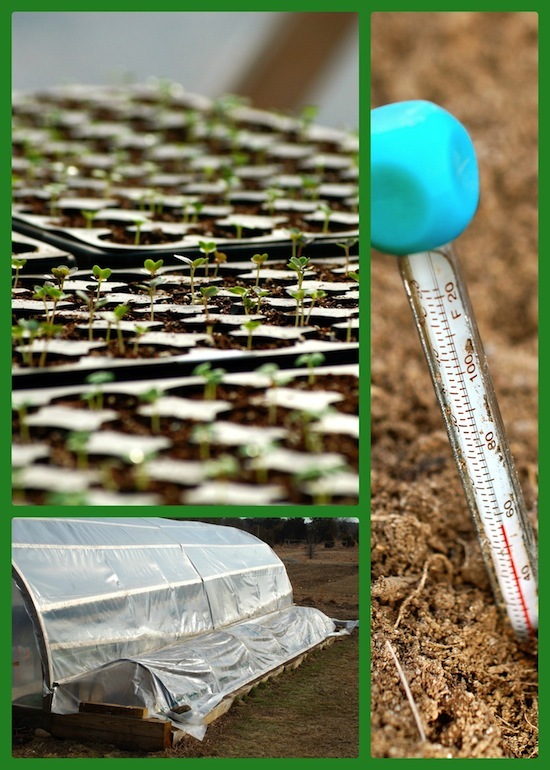 We grew the first batch in the hoop house. Batches 2 and 3 (including the pretty purple stuff) are coming along in a long raised bed outside the hoop house (where the early tomatoes will be transplanted in a few weeks.) Get some of this delicious veggie into your kitchen soon–here’s one recipe idea (a stir-fry; my friend Joannie says this is the best!) 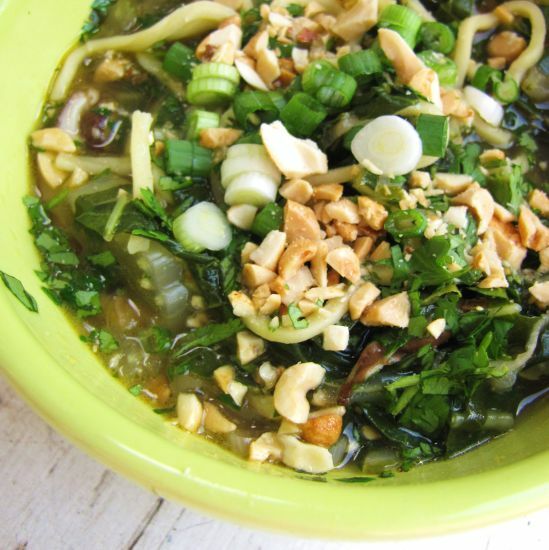 and here’s another (my friend Eliza’s favorite–Spicy Noodle Hot Pot!). 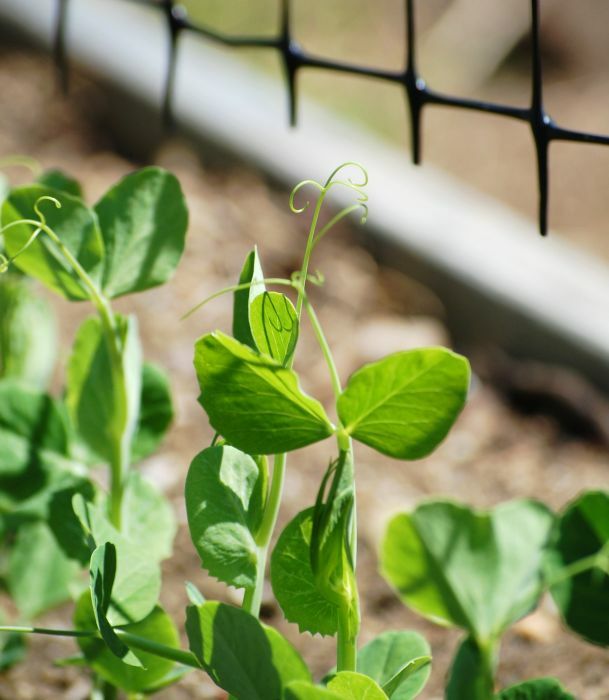 The pea plants germinated beautifully and are ready to come out from under cover, where they’ve been hiding from the birds. 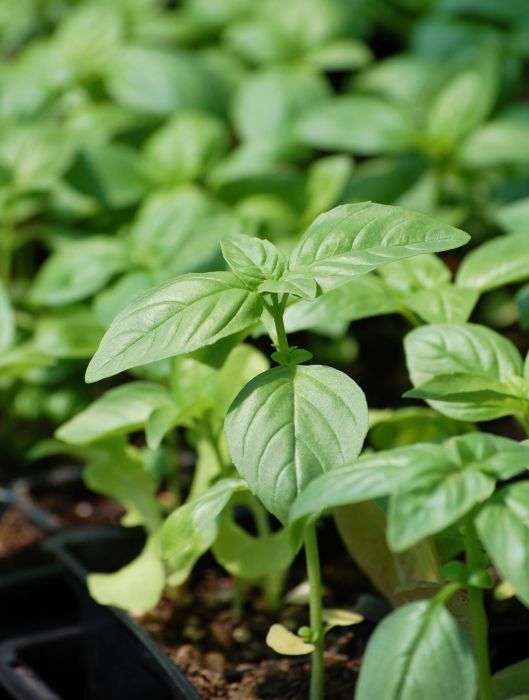 Basil seedlings are healthy and we have hundreds of them! 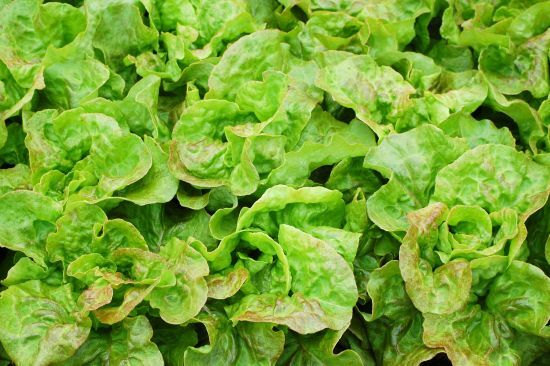 Beautiful Pirat Butterhead lettuce is “too pretty to cut” my friend Mary says. 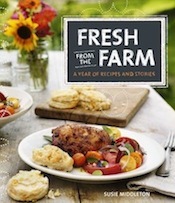 Alas, I’ve already tucked into it and pulled heads for the farm stand. 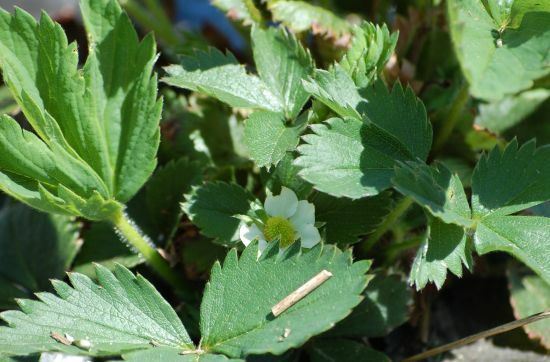 Last year’s everbearing strawberry plants already have blossoms. And yes, the grass is green. I know, I know but this is a big deal to me. We’ve been looking at mud for months. 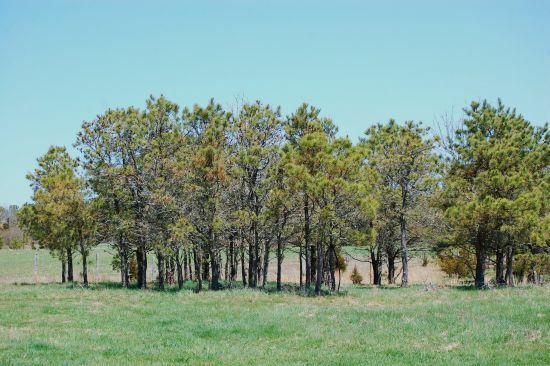 This is the pine grove at one end of our back field, where Farmer and I go for walks. And when it comes to being excited about springtime and fresh grass, no one’s happier than Farmer. We’ll be walking along and all of a sudden he just gets down and does a roly-poly in the grass. He stands back up, shakes, and then skips off, happy as can be. We should all be so carefree. 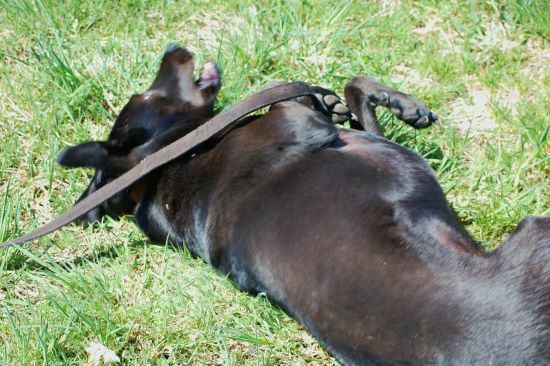 Maybe if your day isn’t going so well, you could try rolling in the warm grass! Guess I can safely say that our “soft” opening of the farm stand this weekend was more successful than the Spider Man Broadway previews. 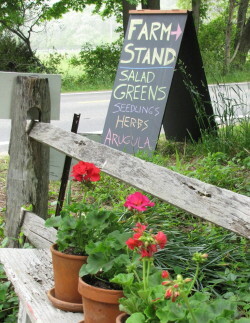 You might even cast it more in the vein of Field of Dreams, because, it seems, if you build a farm stand, they will come. At least if you put a big blackboard sign out by the side of the road, and that road happens to be one of the main routes Up-Island. And also, it doesn’t hurt if it’s a holiday weekend. And the sun is shining. Yikes. Most people would be overjoyed at selling out on the first weekend. 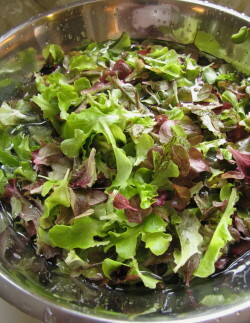 But I felt bad that we had run out of salad greens by Saturday afternoon. I just couldn’t harvest any more from my baby plants without endangering a steady harvest in the weeks to come. So we took the sign off the road, and just left the tomato plants and seedlings out for anyone who happened to notice while driving by. 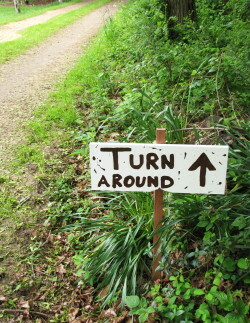 Even without the sign, people spotted the farm stand and turned down the driveway. 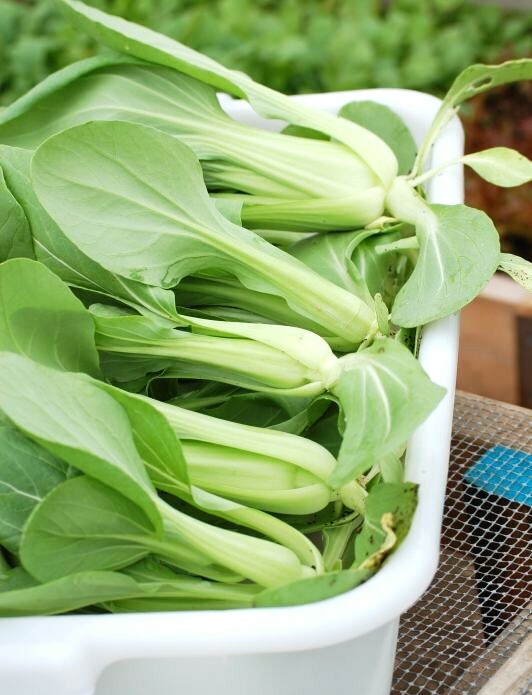 Fortunately, there is a wonderful farmer on the Island, Krishana Collins of Bluebird Farm, who specializes in baby bok choy. So if you live on the Vineyard, you will have much better luck finding hers (at Down Island Cronig’s before the farmers’ market opens in a few weeks) than mine (which is a tiny planting any way!). 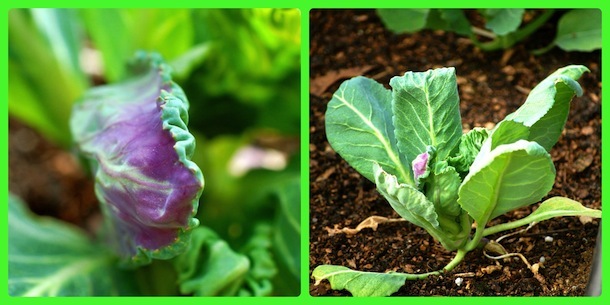 Her baby bok choy (top photo, in the scale) is gorgeous and delicious. Yesterday, I picked up a half-dozen little heads (about 6 inches long and less than 2 inches wide) and stir-fried some for lunch. I did a variation on a recipe from Fast, Fresh & Green, and it couldn’t be simpler or more delicious. The complex nutty flavor of baby bok choy really deepens with browning (no surprise there) and pairs well with Asian seasonings. 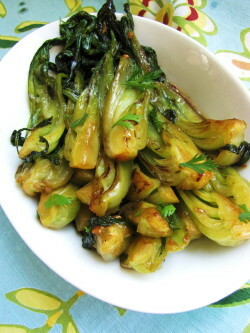 (I also like to brown-braise baby bok-choy, but I am still working on the perfect way to use it in a gratin. It’s also lovely raw in salads and slivered into noodle soups.) 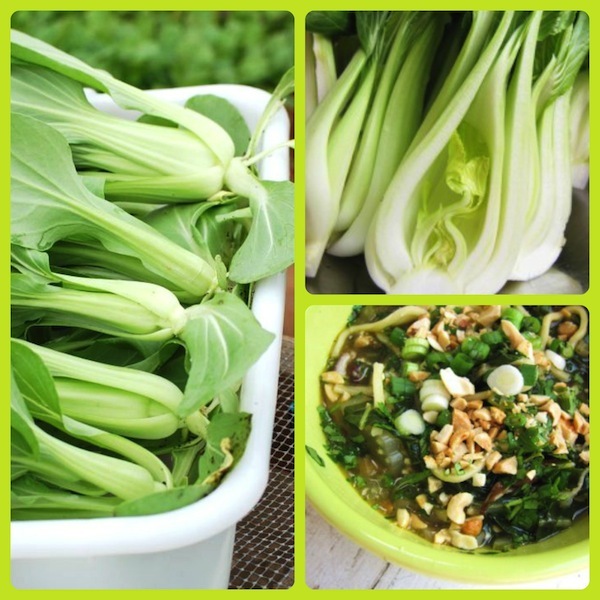 Unfortunately, when stir-fried, baby bok choy loses its beauty-queen looks and becomes more like the charming bad boy–appealing in a rustic kind of way, but definitely delicious. 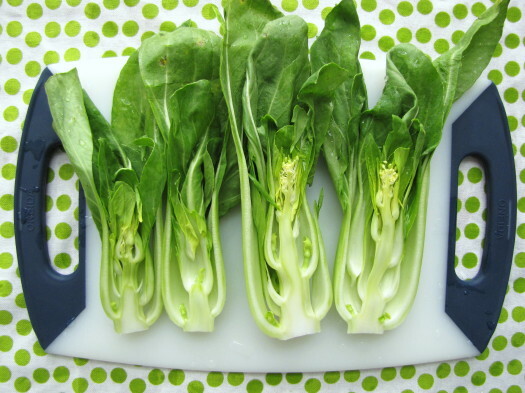 Try to choose baby bok choy that are all about the same size for this recipe. Depending on how little they are, you’ll need between four and six to get 3/4 pound. 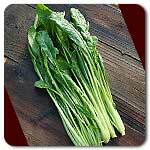 Cut the bok choy lengthwise into quarters if very small (2 ounces), and into six pieces if larger (3 ounces). (There’s no need to trim any of the stems.) Wash them well by swishing them in a bowl of tepid water, and spin them dry. Set a serving dish on your counter. I like a white oval for this. In a small bowl, combine the soy sauce, orange juice, brown sugar, sesame oil, chili-garlic sauce and whisk well. Add the cornstarch and whisk until dissolved. In a large (12-inch) nonstick stir-fry pan, heat the peanut oil over medium heat. When the oil is hot (it will loosen up), add the garlic slices and the bok choy. Season with 1/4 teaspoon salt and turn the heat to high. 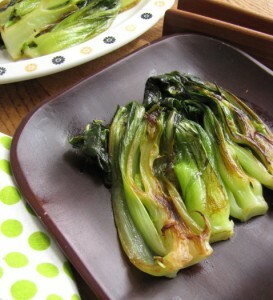 Using tongs, toss the bok choy with the oil to coat and to distribute the garlic slices. Cook, flipping the bok choy with tongs and spreading it out occasionally so that all the stems have some contact with the pan as they cook, and so that the garlic does not all gather on the bottom of the pan, until all of the bok choy stems are browned in parts (the leaves will be well-wilted and browned), 5 to 7 minutes. (If your stove runs very hot or the garlic is burning after the first few minutes, turn the heat down to medium-high.) Take the pan off the heat, pour the sauce into the pan, and stir immediately as it thickens up. Toss well and quickly transfer the vegetables, sauce and garlic to the serving platter. 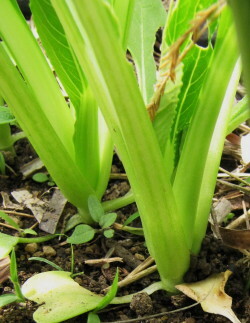 (The garlic will be very brown—some folks like it, some don’t, so push aside if you like!) Garnish with chopped fresh cilantro if desired. Serves 2 to 3 as a side dish. 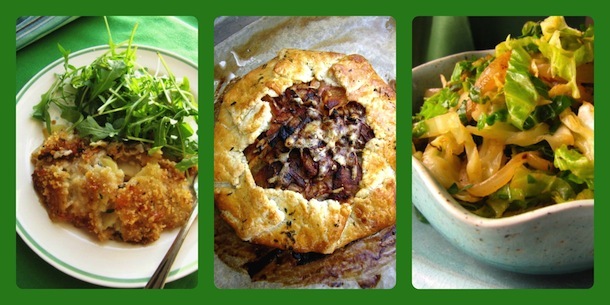 This week I’m in major recipe-development and photo-shoot mode, as I’ve got some last-minute assignments from magazines that need spring vegetable recipes. So I have been tiptoeing off to the grocery store, hoping none of my locavore friends see me pouring over the out-of-season vegetables in the produce section. I’m not sure why I feel guilty, as we’ve definitely done our best to make do with our winter CSA veg (and we STILL have some in the fridge and in the attic). 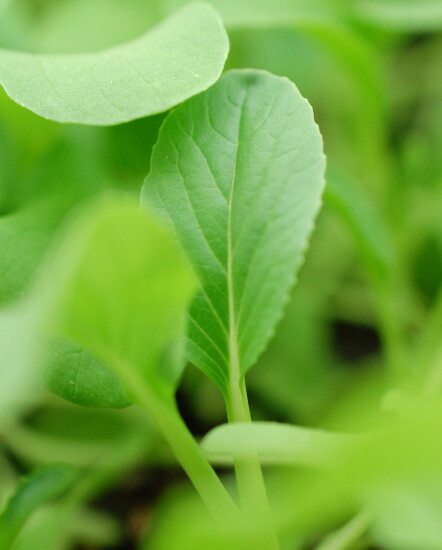 We deserve a little fresh green stuff. But I hate the fact that it’s shipped from so far away. It’s one of the most ironic parts of my job—I encourage people to eat and cook seasonally, but often I’m developing recipes out of season. Well, I guess it’s not so bad this time—spring is right around the corner; I actually saw a forsythia bush in bloom yesterday. 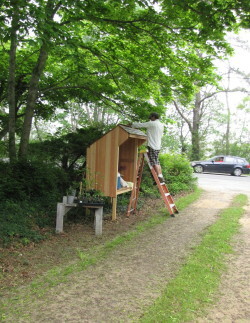 (It was wedged between two barns, so I think it must have its own micro-climate, as the rest of Martha’s Vineyard is still chilled by the cold Atlantic waters swirling around us.) But next week I’ve got an assignment to work on some summer recipes, and talk about challenging—ripe, juicy tomatoes in March? It won’t surprise you that I take this pretty green thing and brown the heck out of it. I’m like a broken record on that subject—browning green veggies almost always makes them sweeter. So I cut these babies in halves or quarters lengthwise (keeping the hint of that lovely shape—why slice these across and wreck that? ), and sear them cut-side down, in a little combo of oil and butter. Then I finish cooking them (sort of part steaming, part braising), covered, in a little bit of liquid. You can easily add garlic, ginger, citrus, soy, or other flavorings to the liquid or at the end of cooking to fancy up the side dish. But this basic cooking method gives a perfectly delicious result. 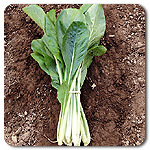 Baby bok choy can vary in size a lot; choose heads that are all about the same size for this technique. If the heads are wider than 2 inches, cut them in quarters, rather than halves, for cooking. Combine the chicken broth, the soy sauce, and the honey in a glass measuring cup and whisk to combine well. In a 10-inch straight-sided sauté pan that has a lid, heat the vegetable oil and ½ tablespoon of the butter over medium heat. When the butter has melted and is bubbling, sprinkle the ¼ teaspoon salt over the pan. 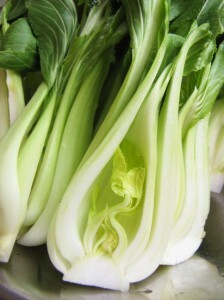 Arrange the bok choy, cut-side down (or one cut side down), in one layer in the pan. (They will be snug.) 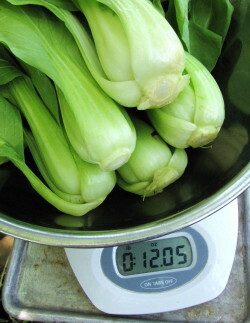 Cook, without stirring, until the undersides of the bok choy are deeply browned, 6 to 7 minutes. Carefully pour the liquids into the pan and cover immediately. Simmer until the liquid is almost completely reduced (a teaspoon or two will be left), 5 to 6 minutes. (Check occasionally to make sure the liquids don’t reduce entirely and start to burn.) Uncover, remove the pan from the heat, and transfer the bok choy to a serving platter. Add the remaining ½ tablespoon butter and a tablespoon of water and stir well with a silicone spatula or wooden spoon as the butter melts, scraping any browned bits off the bottom of the pan. Scrape and pour the pan sauce over the bok choy.